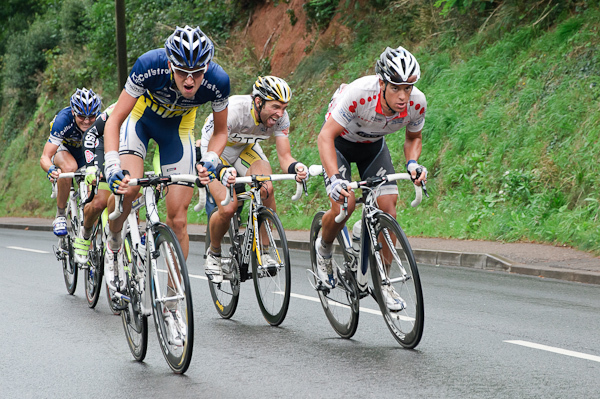 On September 14th Stage 4 of the “Tour of Britain” cycle race passed through Dawlish. The stage was a 171km run from Minehead in Somerset, up onto the hills of Exmoor (twice! ), down through Devon to the south coast at Sidmouth, over the notorious Peak Hill, around the outskirts of Exeter and finally along the coast to Teignmouth. By the time the riders reached Dawlish they’d already covered 165 of those kilometres, but they still came powering up the hill out of the town at an incredible pace. It would be hard to claim that professional cycle racing shares the low-carbon credentials normally associated with two wheels and pedal power – between the police escorts, camera bikes, TV helicopter and support vehicles, I’d say there were more more motorised vehicles travelling with the race than there were riders. It’s certainly an impressive convoy – part sporting event and part carnival procession! In this recording I’ve removed around 15 minutes between the breakaway group leading the race and the peloton (main pack of riders). It was recorded with my MiniPIP microphones in a Rycote basket and an Olympus LS-10.